Are you looking for the perfect holiday dessert? Look no more! 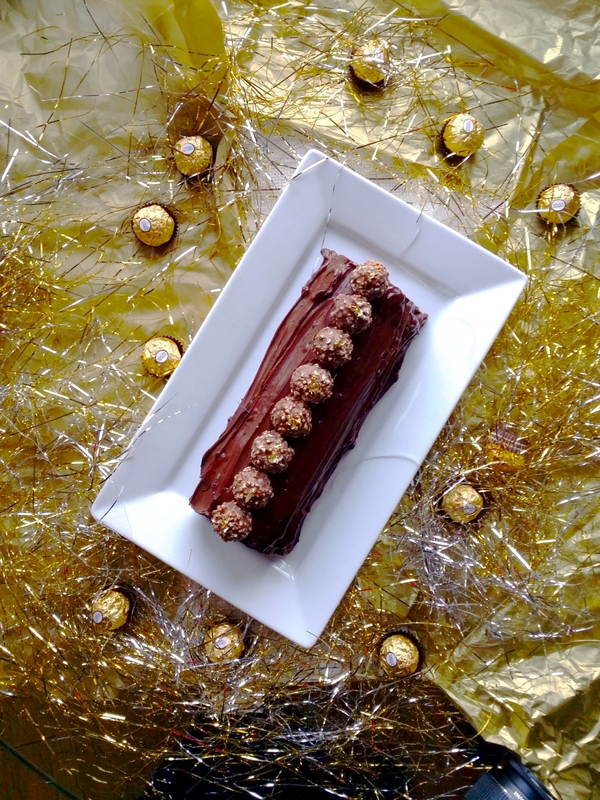 I created this exquisite Chocolate Bûche de Noël just in time for the Holiday season! A very simple and elegant cake to put together and you can make some of the components ahead of time. From start to finish, if you have all the ingredients on hand; it shouldn’t take more than a few hours to prepare and decorate. 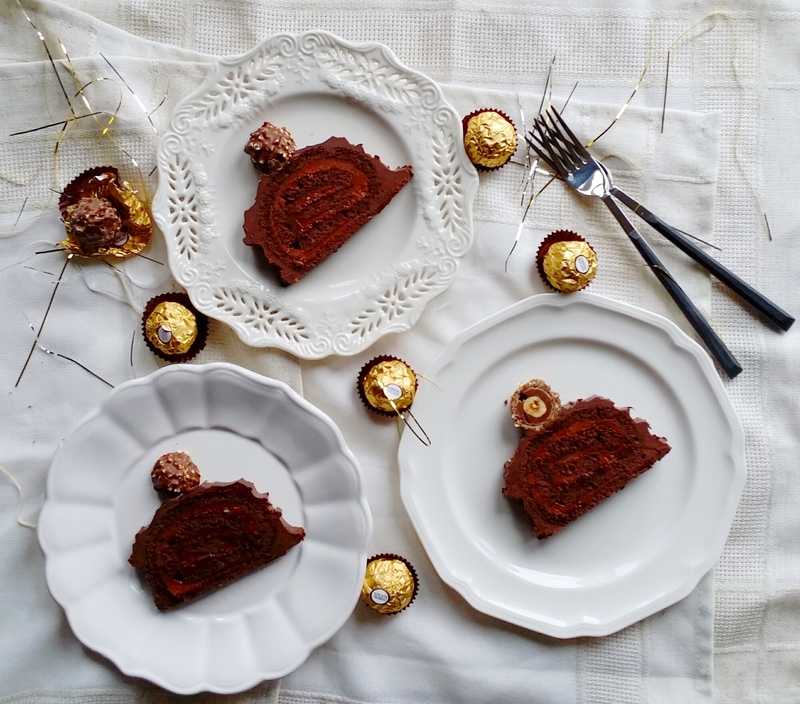 A few notes about this cake: I make many cakes for the holiday season and there is no limit to the variations possible. I like to add rum and/or a shot of espresso to my simple syrup as it goes very nicely with chocolate. If you don’t like alcohol, leave it out as I have in the recipe below. 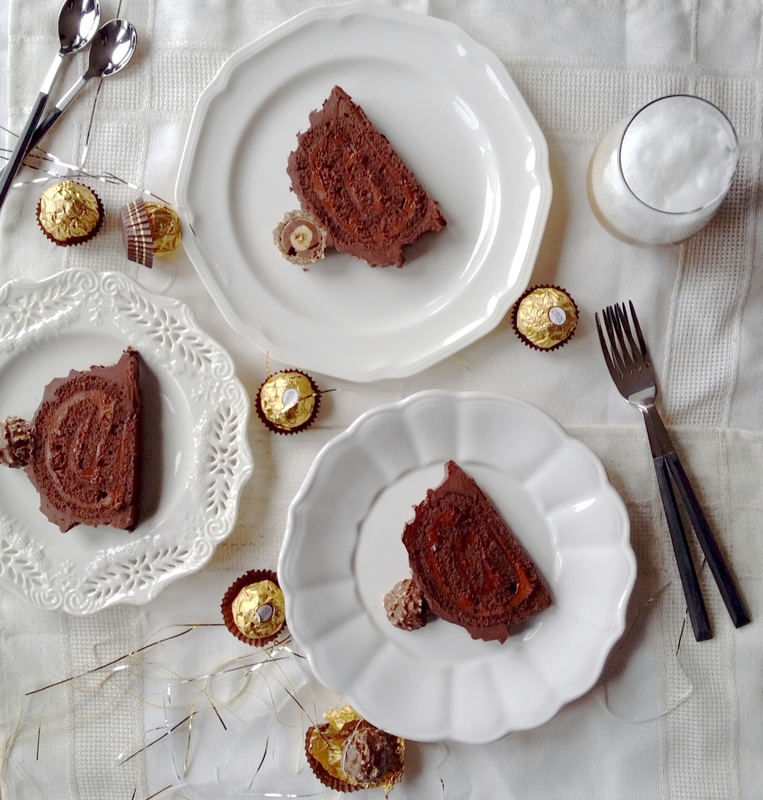 Also, try to use the best cocoa and chocolate couveture possible as the flavours are very pronounced in this type of cake. I hope you enjoy the recipe and please leave a note in the comments if you try it as I would love to hear from you. Wishing you a safe and happy Holiday Season, Enjoy! In a small bowl sift the flour, cocoa powder, salt, baking powder and set aside. In a stand mixer or large bowl, whisk the eggs and sugar on high speed for 8 minutes until tripled in volume and you have a thick ribbon-like texture. Whisk in the vanilla and then slowly incorporate the flour mixture by folding it into the batter with a spatula with quick movments and becareful not to deflate the batter. Spread the batter evenly on the lined baking sheet and bake on 400F for approx 6 minutes. Allow it to cool while you prepare the buttercream. Flip the sponge over onto a clean parchment sheet, set aside until you’re ready to assemble. In a stand mixer or a large bowl, whisk the softened butter and icing sugar for a few minutes until no lumps remain. Add the vanilla and cooled melted chocolate and whisk until combined. Set aside until you’re ready to assemble the cake. In a small pot bring the water and sugar to a boil. Take it off the heat and allow it to cool slightly. Add the espresso or coffee extract and set aside. In a large heatproof glass bowl boil the heavy cream (microwave on high for 2 minutes) or bring to a gentle boil in a small pot. Add the chopped chocolate and let it stand for 1 minute. Whisk until the chocolate has completely melted and the mixture is smooth and silky. Working with the sponge cake first leaving it on the parchment. With a pastry brush, gentlely brush the syrup all over the cake until it is absorbed. Spread the prepared buttercream evenly across the entire sponge. Starting lenthwise with wet hands, start rolling the cake towards the opposite end keeping it fairly tight, but not so tight that the filling comes out. Roll it over and ensure that the end seam is underneath. If you have any syrup left, you can brush the remaining on the top of the cake. You have two options here. 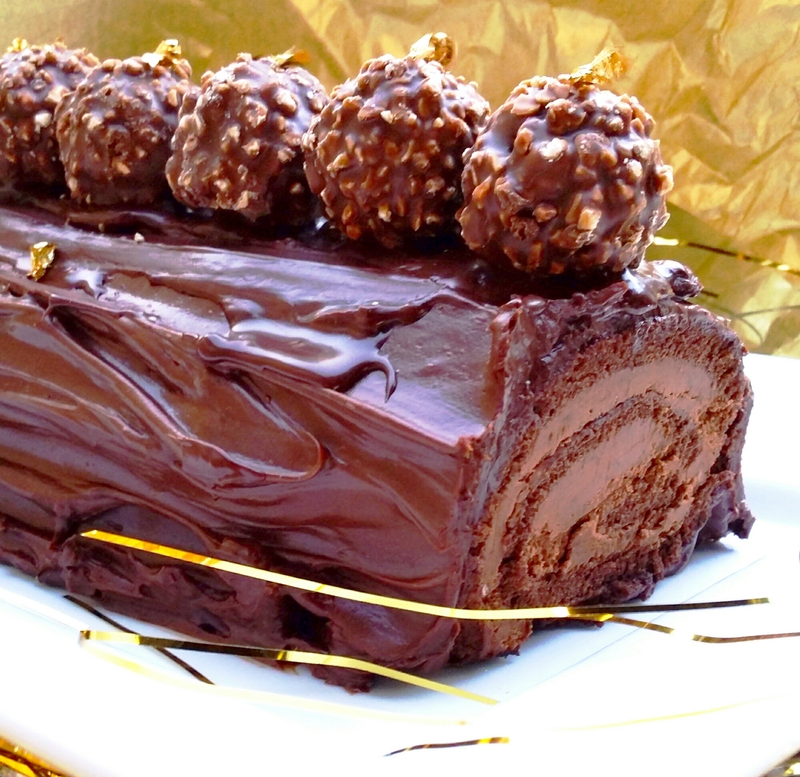 You can either simply glaze or ganache style frosting and decorate the cake into a log. Glaze the cake while the chocolate is warm by pouring the warm ganache over the cake using a cake rack with a ladle and allowing it to cool and then frosted it again with an offset spatula as the ganache firms up. 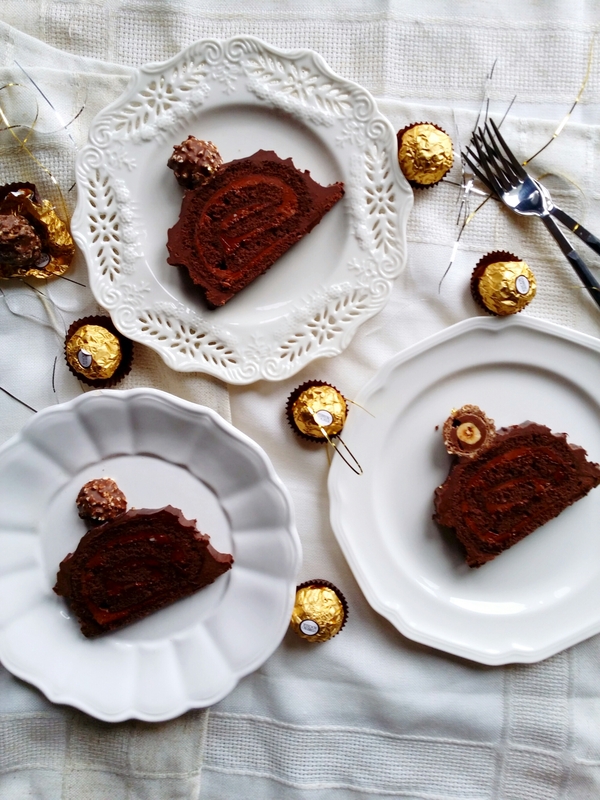 Just before the ganache hardens, adorn the top with whole pieces of Ferrero Rocher Chocolates so that each cake slice will have a piece on top. 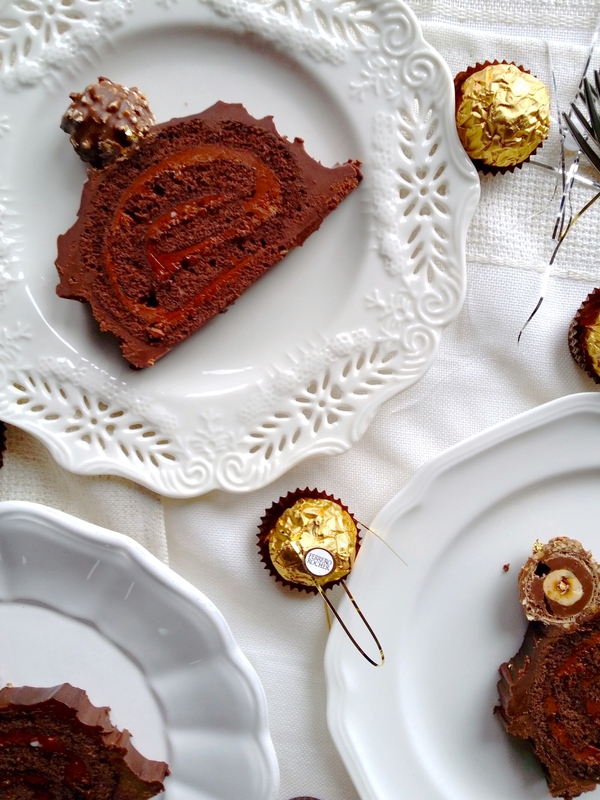 You can further design the cake however you like with crushed Ferrero Rocher Chocolates on the top or around the bottom. Dust the set cake with icing sugar (optional). Enjoy!